It’s my periodic Alameda Landing leasing update. When last we discussed, I wrote about the soft opening of CREAM, a direct competitor to local business Cookiebar. There has been pretty long lines at CREAM since it opened, but that might be due to the slowness of the actual process of testing out ice cream flavors and finally getting your sandwich made. It is kid approved, but Cookiebar was declared to be superior. Of course Tuckers still reigns supreme around these parts, but in a pinch CREAM is a stand in. Yogurtland has also open near Habit to very little fanfare. Still under a handful of reviews on Yelp but given that it’s a well known and popular chain, it’s going to stick around. Speaking of popular, have you all been to Alameda Landing on a Friday evening? That place is pretty popular. I’m not sure if it’s the Jack and Jill hill or the convergence of four fast casual restaurants in a fairly small area but it’s pretty packed. Today there’s a soft opening for CREAM at Alameda Landing (ice cream sandwiches on cookies, like Cookiebar) from 3 – 5 p.m. All proceeds go to benefit the Alameda Boys and Girls Club if you purchase on the soft opening day. The Grand Opening is scheduled for Saturday and they’re giving out free ice cream sandwiches on the Saturday grand opening day. Free! Another Alameda Landing business is also opening on Saturday as well: Spin Pizza. Spin Pizza will open across the street from Habit and — taking a cue from Habit’s successful openings — will donate 100% of the proceeds on this soft opening day to the Alameda Education Foundation if you come in between 11 a.m. – 1 p.m. for lunch and 5 – 7 p.m. for dinner. It’s always a good thing when new businesses support local organizations. It’s been a long time since the Alameda Landing map has been updated and there aren’t a whole lot of changes. I think Sally’s Beauty Supply has finally opened, but I haven’t checked for sure. CREAM supposedly is opening soon-ish but has had to delay their opening several times. The one addition from a purely practical standpoint is the Bank of America ATM going in near Panda Express. For the Bank of America customers out there you’ll know that Lucky currently houses the West End ATM, so having one west of Webster is pretty exciting. I’ll write in detail about the School Board appointment next week when the video gets uploaded, but, to nutshell, based on the twitter timeline from AUSD and reports in the comments section, Gray Harris has been selected and sworn in to fill out the remainder of Niel Tam’s School Board seat. There were some surprises and some not so surprises, but again, I wanted to get a chance to watch the actual video before writing too much in depth about it. Simply based on the information on the twitter play-by-play, it appeared that — much like during the vote the last time that it took someone showing true leadership and relenting to move the issue along. Last time it was Jane Grimaldi who made the gesture, this time, the man that she stepped aside for switched his vote after seeing that the other three were too entrenched in their positions to move the vote along. On a lighter note, this weekend is the Art and Wine Fair on Park Street which can only mean one thing, that’s right, funnel cake. The ironic thing is if that is the case then she has done nothing of the sort. As someone pointed out after the Alameda Point Site A vote, Trish Spencer has approved more housing units in her first six months in office than Marie Gilmore did her entire four years as Mayor. As another commenter pointed out, it’s puzzling how she has gotten such a pass from her constituency if that was, in fact, why she was elected. Last week, I took the kidlings to Alameda Landing for their snack time treat. My timing was impeccable because there were some Alameda Landing folks sticking up new directory maps indicating what stores were where. While I have been keeping track of most of the businesses there were a few that I was super curious about but were still in it’s general category phase on the leasing maps. This is probably the first time I’ve been really concerned about the viability of a specific small local business. Yesterday while visiting Alameda Landing I noticed sign with a cookie ice cream sandwich on the window and language about Facebook liking. Upon further inspection it appears that CREAM (Cookies Rule Everything Around Me) is coming to Alameda. It’s (essentially) the model that Cookiebar borrowed, pick your own cookies and pick your own ice cream to make your own ice cream sandwiches. Fortunately for CookieBar it has some really interesting flavors (Vietnamese Coffee is yum!) and is making its own ice cream. Let’s hope the West End is big enough for two cookie ice cream sandwiches. Your occasional Alameda Landing update. The registration period for the Alameda Landing BMR units closed earlier this week and word has it that 500 applications were submitted and 120 applicants qualified with 3 preference points. So essentially if you are not a four or more person household living or working in Alameda you are out of luck. Remember there are only nine units available for sale. 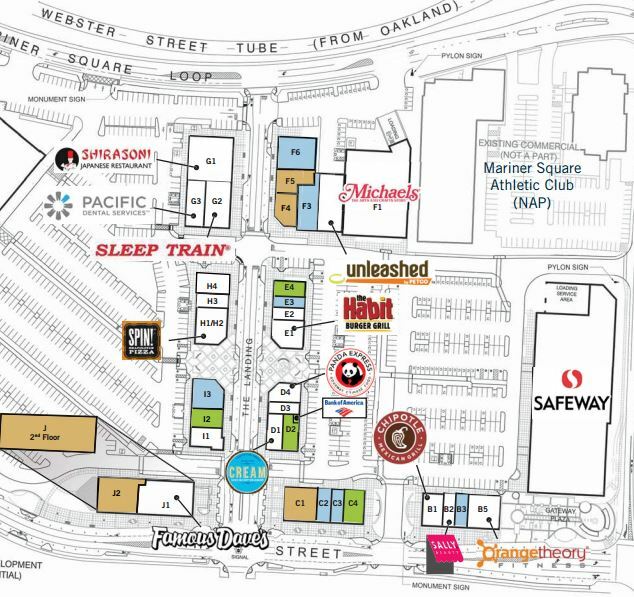 There was a rumor somewhere that California Pizza Kitchen is moving into the space across from Habit Burger at Alameda. 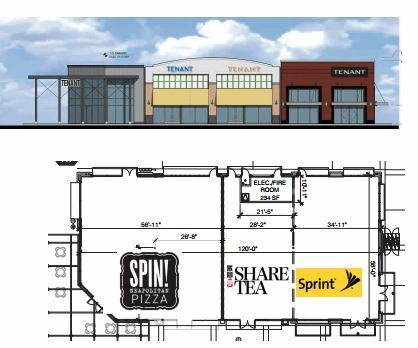 As of yesterday the spot was still being leased to Spin Pizza, so I’m not sure where the info came from. Two of the smaller spaces officially have tenant names and based on the type of store and the demographic close to Alameda Landing (college) they’re going to do well. First up, next to Spin Pizza is Share Tea which is a boba milk tea type place. I’m not a fan of boba milk tea, I have a tricky relationship with dairy, but it’s huge with the young ‘uns. Super huge agenda tonight for the City Council, I’m feeling super behind because I haven’t even written everything that I wanted to write about last week’s City Council meeting and now we’re already having another City Council meeting, I guess it could be worse and I would have nothing to write about but still…City Council, stop being so amusing and entertaining, I need to catch up! So tonight’s City Council meeting has two meaty items in “workshop” format. The last time we had anything close to a workshop was the Special Meeting about how to run meetings and it was chaos. This time around, hopefully, after being reprimanded by John Russo to get control of the meeting, Trish Spencer will have a firmer grip over the meeting. Or she’ll continue to let people speak way over the allotted public comment time and then complain about how there is an “agenda writing” problem and place the blame all on staff. Well tonight there’s only two real agenda items, so we’ll see how long this meeting goes on for and whether we have another “agenda writing” problem tonight. The first (well the second agenda item) is the whole uber Transportation plan thing that was before the Transportation Commission and Planning Board the other night. Tonight the City Council will vote to put their money where their rhetoric is regarding transportation issues and they can choose to issue a RFP for creation of this uber Transportation plan (approximate costs are $250 – 400K for this strategy alone and could take up to a whole year to actually produce given the levels of community input that are expected). There is no funding identified for this yet so best case the city staff can go out for grants. Some of the City Staff has been very successful at securing grants in the past. But worse case it will come out of the general fund. The second (but really first) agenda item is around the super hot topic of density bonus. Recall that during the Del Monte discussion some of the people who opposed the project did so on the basis that some how the density bonus was improperly applied and asked that there be a moratorium on any future density bonus approvals until such time that the density bonus application process was all sorted out. Frank Matarrese took up this mantle and here we are. I’m trying really hard to care about the City Ventures project over on Clement Street, but am finding it difficult to get too excited about the project. And I’m a big fan of infill development. Maybe because it’s all faux Victorian looking. Eh. The Clement Street side will have a sweet view of the Operational Support Center thing. I think the project may be slightly overparked given the plethora of open spaces on Clement. I feel like they are trying to appease any possible opposition by ticking off all the boxes of what people may get pissed about before it becomes an issue.